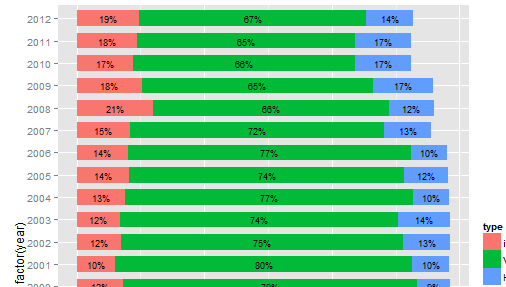 i want to show percentage of each individual bar as 100% then divided into groups. So in effect, I first find the count of success given person and city and divide that by the total counts (all_counts), which is the total number of people given city. Then we find the percents and then plot it using ggplot. Because these are aggregated, we use geom_bar with (stat = "identity") and use geom_text, which prints the percents (position_stack(vjust = 0.5) centers the label). Finally, we facet it based on city. The coord_flip() line flips the x and y axes. How to add percentage or count labels above percentage bar plot? How to calculate the percentages per bar in stacked bar plot? Counts of categorical values on bar chart in ggplot?